In the heart of southern France is the cosmopolitan city of Toulouse. They say this is one of the places that you must visit if you really want to fully enjoy the beautiful country, founded by the Gauls. A lot of festivals and a fabulous mix of historical heritage and modern culture are part of which characterize the French town. One of the emblems of Toulouse is the local Capitol, in which is located the municipal administration. The architecture of the building is more than impressive. The building was built in the 18th century, in neo-classical style. The front facade is 135 meters long. The Capitol is also home to the local opera, and the Hôtel de Ville. For this and most other buildings in Toulouse, a pale pink colour is characteristic. Not accidentally, it is often called the "pink city". This is due to the specific blocks and the tint with which buildings were built from the 18th and 19th century. Almost every one of the old hotels in Toulouse is a kind of architectural masterpiece. The basilica of Saint Sernin is another popular attraction in the French city. It is the largest Romanesque building in Western Europe. This masterpiece was built in the 11th century, from pale pink bricks. The temple guard crypt holds religious relics of many centuries ago. The basilica is named after the martyr-bishop Sernin. The cathedral of Toulouse is also among the most visited places by tourists. It is considered as one of the historical landmarks of France. The religious temple dates from the 13th century. Even more ancient is the Basilica Notre-Dame de la Daurade, founded in the 410th year. Among the cultural attractions of Toulouse is a magnificent Gothic building that houses the Museum of Augustins. Exposures of the cultural centre acquaint guests with wonderful works of art. Other very popular museums are Les Abattoirs, Art Museum Foundation Bemberg, Musée Saint-Raymond, Museum of Contemporary Arts Les Abattoirs, and scientific center Cité de l'espace. 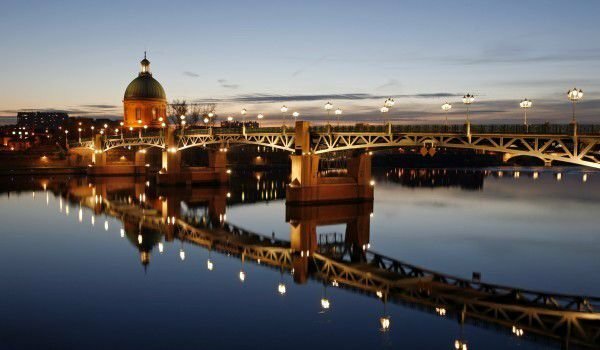 Coolness and style to Toulouse is provided by the beautiful river Garonne. Over the centuries, it has had and still has enormous implications for urban development. Even today, locals joke that Toulouse is in love with the Garonne. Over the river, there are beautiful bridges and banks that are very suitable for walking among the wild places of the French city. During the summer months around the river are geared up magnificent beaches. If you are visiting Toulouse in June, you will enjoy the unique Rio Loco Festival, whose main stage is the water and the area around the Garonne. Among the most remarkable bridges in Toulouse is Pont Neuf (translated as "new bridge"). The historic facility that has become a popular landmark was erected in the 16th century. One of the most popular green area is the park Jardin des Plantes, built in 1730. The territory of the open complex has an exquisite botanical garden. The park is located southeast of Toulouse. The famous Canal du Midi passes through the town, considered the oldest canal in Europe that is still used today. Canal du Midi, 240 km long, connects the Atlantic with the Mediterranean. Built in the 17th century, it is now under UNESCO protection. The French city has concentrated many companies producing spacecraft. In Toulouse is the largest space centre in Europe. Toulouse is located equidistantly from the Mediterranean and Atlantic. The capital city of Paris is 590 km. away. With its 1.1 million inhabitants, Toulouse is the fourth largest on population city in France. Before it are only Paris, Lyon and Marseille.